In a world desperate for a cultural shift that can offer us a future beyond the inevitable crash of consumer civilization, those who have a better vision and those who have the knowledge and skill to bring ideas into fruition are finding it easier than ever to connect and make amazing things happen. 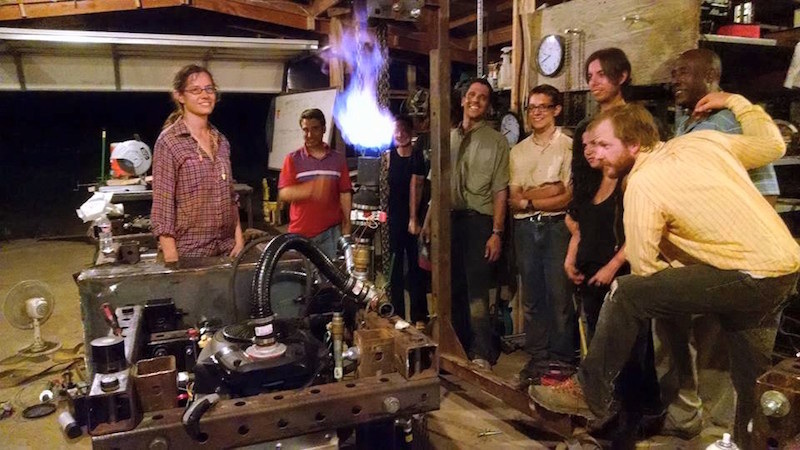 We have before us the great potential for the emergence of the ‘maker culture’, a culture where communities make what they need out of what they already have, using ideas and plans developed, tested and shared freely via open source. Among the ranks of incredible people around the globe who are actively bringing about this kind of societal transformation is Marcin Jakubowski, a Polish born US immigrant whose grand vision for the future of technology and local sovereignty is being built, right now, on a small Midwestern farm in the US. After earning a Ph.D. in fusion physics, he settled down on some acreage in rural Missouri to learn the more practical skill of farming. Now he’s become the mastermind of Open Source Ecology (OSE), a NGO [non-governmental organisation] and hive of engineers, architects, innovators, farmers, and forward thinking pioneers, who are condensing 250+ years of industrial knowledge into a single set of machines and tools that will allow individuals to accomplish industrial level infrastructure, machining, farming and energy projects on a small, local scale, using locally sourced and re-purposed materials and biofuels. 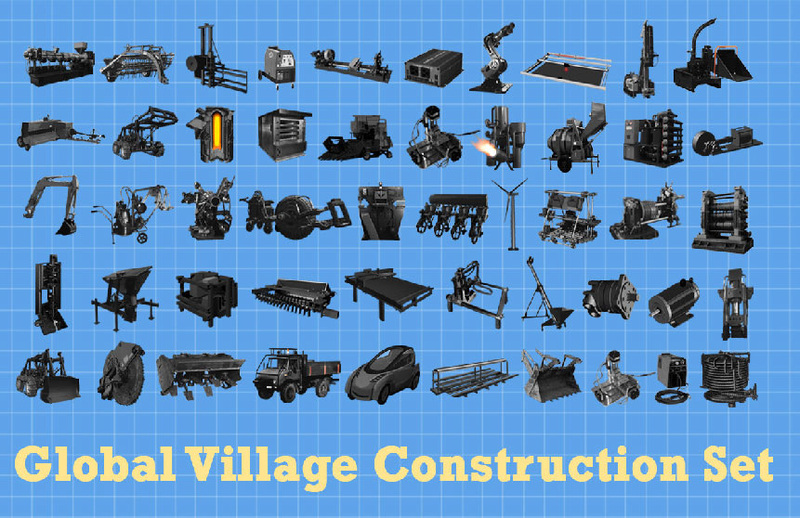 It’s called the 'Global Village Construction Set' (GVCS). True to the spirit of the maker culture and the collaborative social revolution, the immense technical designs, plans, specs, schematics, manufacturing processes, materials and costs for the GVCS have been available to the public, free of charge, free for download, and open for public comment, here at the OSE wiki page and here at Open Source Ecology. 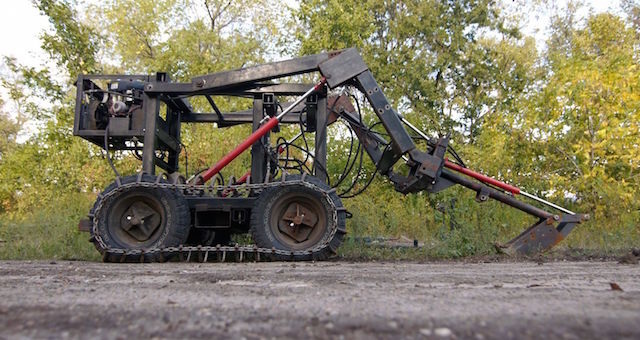 The brick press can produce over 5000 bricks in a single day using nothing more than dirt and soil. The attention garnered from the TED talk has helped the project connect with dozens of volunteers and like-minded people around the world who’ve been steadily pushing this project forward, contributing their effort and intelligence both virtually and in person. The organization is expanding its home, Factor e Farm, where they are using the GVCS to build a fully functional sustainable community prototype, including housing for volunteers and farming projects. a generalized power source that can produce electricity as one of its applications. As of 2015, a total of 18 of the machines have been built as prototypes, and replications of the machines are beginning to show up around the world. 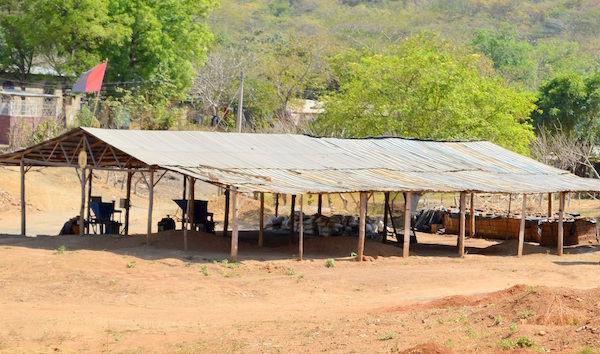 In Nicaragua, the GVCS brick press is being used to create dozens of low cost houses for people who otherwise could not afford to purchase the building materials. 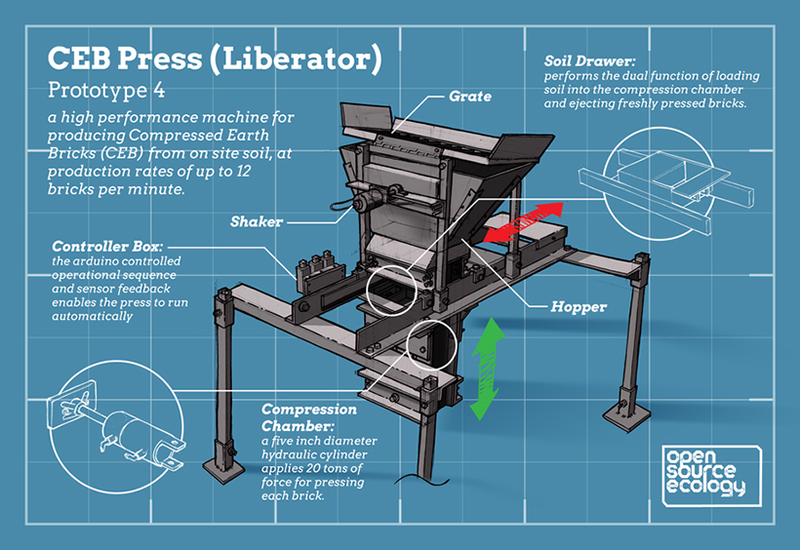 The brick press can produce over 5000 bricks in a single day using nothing more than dirt. 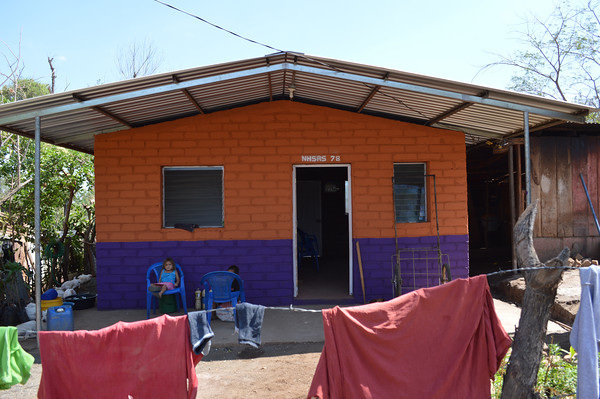 A house in Nicaragua constructed out of bricks made with the GVCS brick press. The ‘Liberator’ brick press on the left side of the bodega. In addition to designing and prototyping the GVCS, Marcin and Open Source Ecology are also teaching people how to complete modern sustainable farming projects, like aquaponics systems, via online courses which can be taken from anywhere around the world. 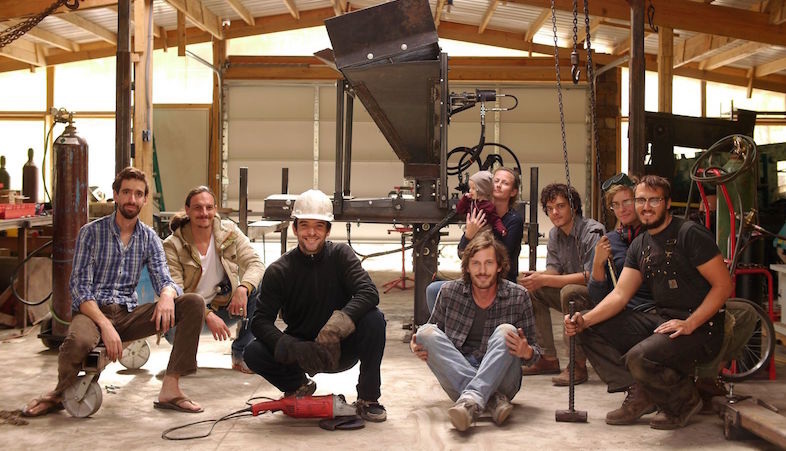 Their current project, which builds a greenhouse, an aquaponics system, mushroom cultivation and several other sustainable farming systems into one project, and builds the entire thing in just a 6 day period. The ambitious goal of Marcin and his collective of pioneers of sustainability is to effectively end artificial scarcity by demonstrating what a new ‘maker culture’ can look like when super-imposed on top of the tail end of consumerism. The time for this level of global collaboration is now, and we have the knowledge and the technology to subvert the current system by creating something new right where the old one stands. 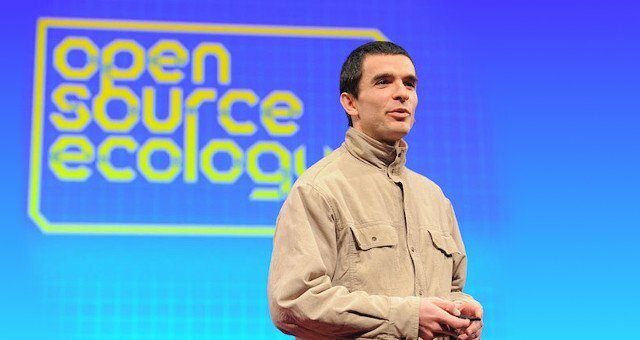 Open Source Ecology is onto something huge here, and what they need more than anything right now is to reach as many people around the world as possible in order to connect to those very few people out there who have the interest, knowledge, talent, and will to assist in pushing this project to completion. Do you know of anyone who might like to contribute? Technology has opened new frontiers. No longer do continents and cultures inhibit collaboration, and when an idea’s time has come, the entire world at large can review, it, evaluate it, support it, contribute to it and share it. In the spirit of collaboration and networking, please share this inspiring story far and wide.